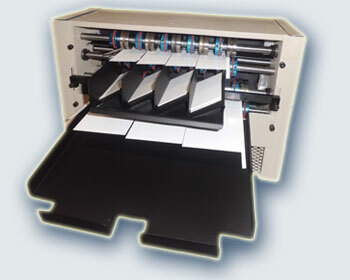 The ERSO 1204 AB Professional Automatic Electric Business Card / Card Slitter is our new product. This new design of paper cutter machine allows you to manually set up the distance between blades and cut the desired size cards. Our company ships this model with blades positioned for standard business card size of 2" x 3.5". The ERSO 1204 AB Business Card / Card Slitter accommodates 8.5" x 11" stock and cuts 12 business cards of 2" x 3.5" per page with a simple two-pass operation. First pass cuts an 8.5" x 11" sheet into three 8.5" x 3.5" strips and then second pass cross cuts these 3 strips down to finished 2" x 3.5" cards (4 cards per strip). The size of 3.5" can be adjusted from 3.5" to 5" on the first pass. On the second pass the size of 2" can be changed to the size of your choice from 1.8" to 4". The infeed stack allows keeping up to 50 pages of 14 pt /310 g/m2/ paper and cutting at a speed of up to 300 business cards per minute.